There are a host of attractions within easy reach of West House B & B. Many of them are listed below, along with web-site links and contact numbers. Cadwell Park is our local race circuit holding events for both motorcycles and cars. Their most prestigious event is the MCN British Superbike Championship Race, held every August Bank Holiday. Cadwell is 13 miles from West House B & B. For more information regarding events please click on the link above or contact Cadwell Park Circuit, Louth, LN11 9SE. Tel: 01507 343248. Market Rasen has its own horse racing course, this is 8 miles from us. For more information please click on the link above, or telephone (01673) 843434. 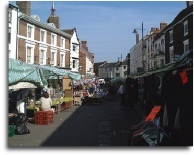 If you enjoy visiting local towns and cities then Market Rasen, Louth, Cleethorpes and Grimsby are within approximately a 12 mile radius us, with the historic City of Lincoln only 24 miles away. If you fancy a day out at the fun-fair, or a visit to a theme park, then Fantasy Island Theme Park at Ingoldmels is only 30 miles away. Pleasure Island Theme Park is 12 miles from us. If you fancy a day out at the beach or a seaside resort, Skegness is 27 miles from us, Mablethorpe is 24 miles away and Cleethorpes is about 13 miles to the East. To the south is Sutton on Sea which is 29 miles away. The beach at Sutton on Sea is usually quiet with toilet facilities and free parking. Dogs are allowed on the beach. During late November and December there are usually seals with their pups at Donna Nook. This can make a pleasant trip out with a walk along the coastal path from where the seals can be seen. Donna Nook is 18 miles from Binbrook. There are also Nature Reserves close by at Gibraltar Point, Theddlethorpe Dunes and Snipe Dales. Another interesting day out is the RAF Battle of Britain Memorial Flight at Coningsby (21 miles away). Also, there is the Lincolnshire Wolds Steam Railway. The only standard gauge steam railway in Lincolnshire open to the public. Based at Ludborough, some 12 miles from us, the railway is open to the public between March and the end of October. Click on the link above to find out more. There are regular events going on in Binbrook village which is a few minutes walk from us. These are listed in the village newsletter and visitors are welcome to join in.